It is hard to miss this billboard on I-35 just outside of Emporia, KS. I do not think that it is the most helpful way to connect people with Christ. However, I think that there may be a few people who would respond to this type of invitation. I think that one of the least helpful aspects of this type of sign is that it does not connect one with a local community of faith. I don’t like billboards like this one because they present a narrow stereotype, depend on a fear motivation and don’t really make people think. I agree, Andrew, but I think that those who put up such billboards are not concerned with connecting with a community of faith as much as “getting one more on the boat”. I also personally think it’s an almost cowardly form of evangelism that plenty of churches practice… put out a sign and it makes us feel good, but don’t ask us to personally talk to someone about faith, much less Jesus! On the other hand, at least it’s modern English. At my last appointment a local church had a sign by the road that read “Ye must be born again!” Folks might not have known if it was an invitation to salvation or to attend a Shakespearean play! When I read signs like this, I wonder if they would even want them to come into the kingdom. With such great focus on the regret, it’s as if to say-you’re not and I AM!! There is only so much one can do with such a sign. 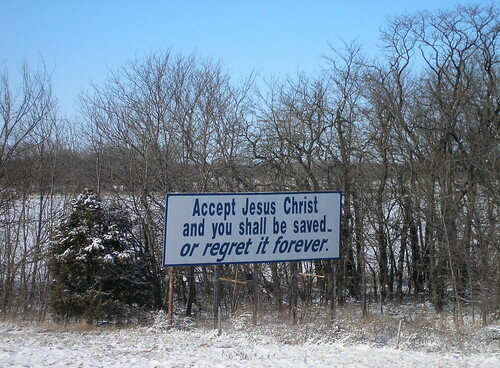 This particular sign is far from ideal but at least minimally it clearly presents the certainty that in accepting Jesus one shall be saved and that failing that choice, one is faced with the certainty of regret. In a sound bite world, the gospel can by such signs only be communicated in bits and pieces. This sign presents one of the pieces. Maybe someone could put up a sign that would help present the rest of the story. Kansas Bob – I tend to agree with you. Dan – Thanks for bringing up the point about lack of concern in connecting someone with a community of faith. I think that you are right on in this assessment and it is something that I missed. Did you ever have a conversation with the leader at the church with the Shakesperean invitation? At least there was some connection with a local congregation. Jason – Your comment really makes me think. Thanks. Earl – The sign does clearly make a point. I think that you have an interesting proposal. I have not had any experience personally, but it makes me think of the Burma Shave advertisements of days gone by.